Squirrels are sure to put a dent in your budget as they devour everything in sight, not to mention the starlings and blackbirds that can dominate your feeders to the exclusion of the birds you really want to attract. 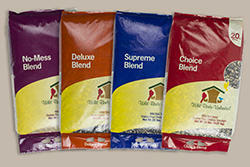 Our quality bird foods target the specific birds you want to attract and discourage the birds you don’t. We have exclusionary feeders and accessories that can prevent those domineering squirrels, rats, blackbirds and other nuisance critters from eating you out of house and home. There are certain times when your birds need a specific type of bird food. Maybe life is just a little too stressful and birds need a different type of nutrition than what they are getting from your regular bird seed. Or they are having too difficult a time getting to the feeders because of those four legged backyard dwellers who don't like to share (you know who I mean). We have a seed for that. 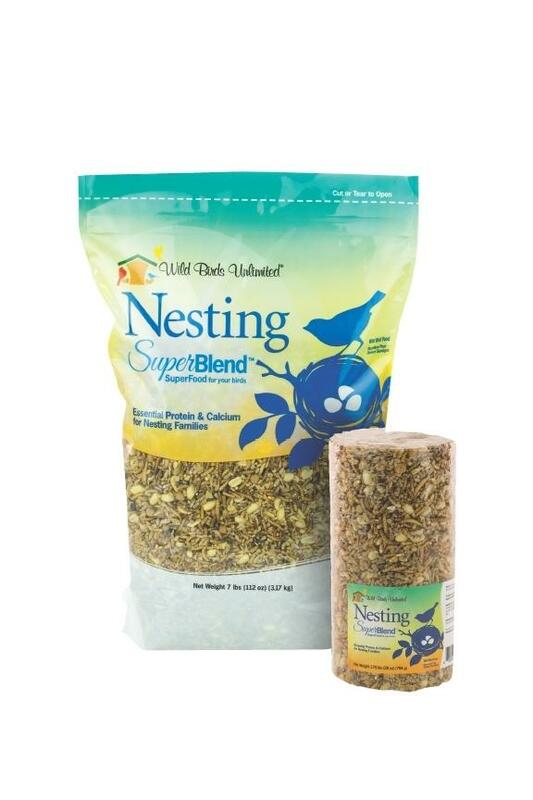 Just in time for nesting season, this high fat and protein food is loaded with nuts, sunflower chips, mealworms, suet nuggets and calcium that will supply all the specific nutrition your backyard birds need to have healthy baby birds. And as it is available in both loose seed and cylinders, it will work in every backyard feeding station. Just what you need to deter both squirrels and rats! 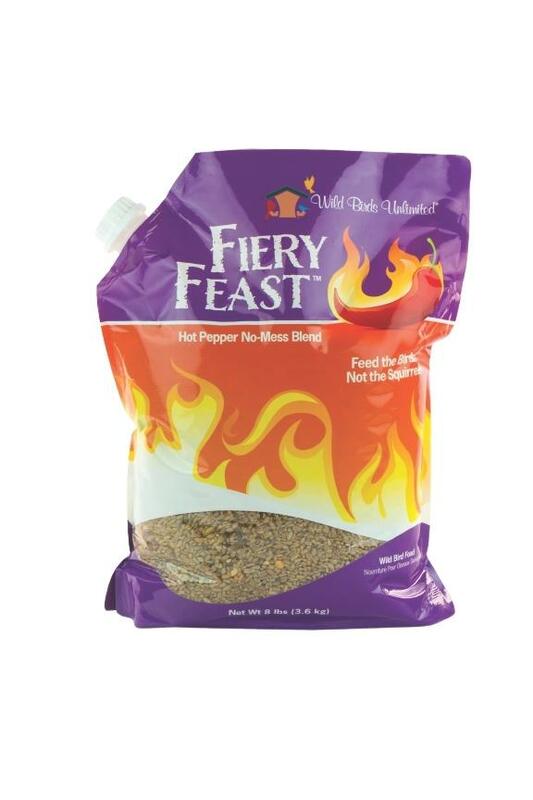 These seeds are coated with a very hot spice blend that has proven effective in stopping anything other than birds from eating the seed. And don't worry, it will not harm your birds. Birds and mammals have different taste receptors in their mouths so that what a squirrel will find very hot, a bird won't notice it at all. And it will not harm the digestive tract in birds either so don't beconcerned (unless you're a squirrel). 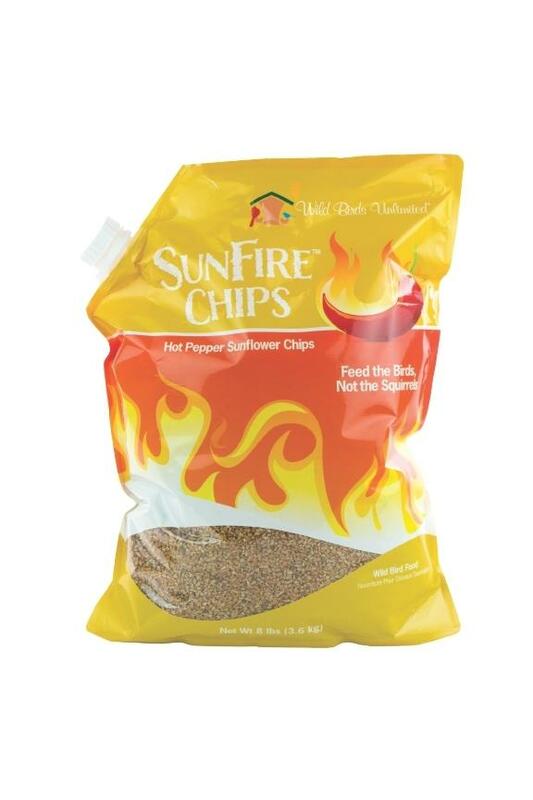 Fiery Feast is a "fiery" version of our No Mess No Millet bird food while the Sunfire Chips is the same as our regular sunflower chips (only hotter). Both bags come with a plastic screw top so you don't have to handle this seed at all when pouring it into your bird feeder.